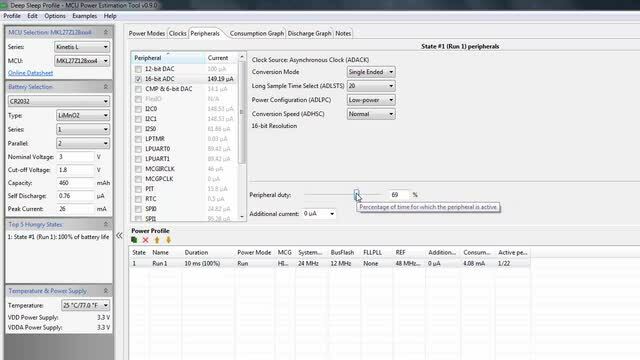 The Power Estimation Tool for Kinetis® MCUs lets you estimate and optimize your system's power consumption quickly with a simple graphical interface. This tool helps you design for efficient use of energy - a requirement for Internet of Things applications. Simply install the tool (download) or use the online tool (MCUXpresso Config Tool) to add details of your system - including the power mode, clock mode, peripheral settings and duration for each system state. It also provides immediate system power estimation results including average current, battery life, and consumption charts. Ideal tool for developing wearable and other battery-operated applications. Using the same online tool as the Kinetis Power Estimator, you can download a custom SDK based on your specific development platform or Kinetis device.